Welcome to the Dragon Cave Wiki forum topic! 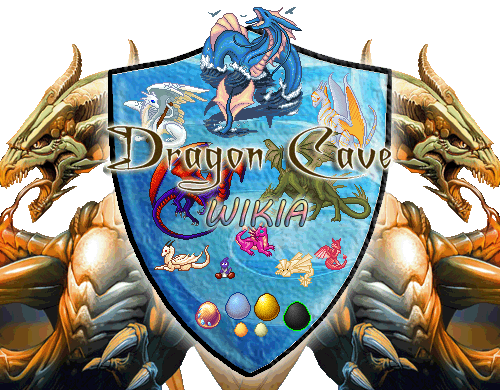 Please note that Dragon Cave Wiki is a community driven site that anyone can contribute to. Because of that we would like to ask you not to take everything you read as hard facts, even when we're trying to keep the Wiki as accurate as we can. The admins are neither part of the main Wikia staff nor hired or paid by the owner and creator of Dragon Cave. Wikis are community projects. Due to the nature of this, admins are not "in charge" of the site. They are simply users who are trusted and active in the community, and given additional tools for maintenance tasks as a result of this increased level of trust. Decisions are made by the community via discussions, not by the sole discretion of admins. If you think something is wrong on the site and don't feel you can change it for whatever reasons, feel free to contact an admin to help you- keep in mind however, that they are there to assist in matters rather than act as authoritative figures to "fix" situations. If you have any questions, suggestions, constructive critique or anything else you'd like to share with us feel free to let us know by posting on this topic. Why is there an empty "Draks" subcategory of "Dragon Types" in addition to the "Drakes" subcategory? Does the wiki know about possible future releases of Draks? Nope we don't know anything about future releases of "Draks" or any other dragon. We were asked by SockPuppet Strangler to change the name of the "Draks" category since it caused a lot of confusion here on the forums, so we added a new category called "DC Drakes". The empty Draks category was just a left over and got deleted a few minutes ago. Dovealove (creator of the first Drake - Ochredrake) only changed to "Drak" when people thought "Drake" couldn't be used. (TJ's comment on the forums) And since this whole "Drak vs. Drake" (← link to suggestion topic on the forums) matter caused a lot of confusion, we will now reffer to them as "DC Drakes" on the wiki until further notice. I'm just going to leave a note here saying that if anyone puts something outdated or outright stupid on the page about me they can expect it to be removed by me personally, possibly with snarky comment. Because it's happened before and I was quite cross so I did. You can remove anything on your artist page on the wiki if you think it's not accurate. I just don't think it's neccessary to remove it with a snarky comment since most people don't add information (like adding a link to long-deprecated dA account, rotating avatar or misspell a name) with a bad intention or to hurt your feelings. Feel free to contact either Nyastara, MisunderstoodDreamer or DangerousDangerously, if you would like to have your artist article protected, this way no one can edit it except for the admins. Ok that's nothing we want to happen to anyone. I will keep an eye on your artist page and will remove stuff which wasn't added by you personally and contact you if the information is legit. Would that be ok with you? Updated the links of her profile and talk page in the first post. Hmm ... the "Striped Dragon" site is not protected so you should be able to edit it. Could you send me a PM with the message you've got displayed when you tried to edit the article? The articles for the new dragons were created (Bleeding Moon Dragon and Imperial Fleshcrowne), and they were added to the "Dragon Types", "Dragon Sub-Types", "Wich Egg is Which" and "Dragon Release Timeline" articles. Why are the Golden Wyverns listed under the 'Rare' column in Which egg is Which when Blusang Lidwurms are not? I'll check that out right away! Thanks for mentioning it. I added the Blusang Lindwurms to the "Rare" section on the "which egg is which" page. If you notice something like this and you have an account (the "which egg is wich" page is protected and can only be edited by registered users) on the wiki feel free to correct errors like that. Just a reminder of the release rules! Add the dragon(s) to any page apart from this one. Add the spriter's alt(s) till they're adults. Add the spriter's alt(s) to the Spriter's Alt page. If you do not follow these rules it will result in a warning or even a suspension (one week suspension for creating the dragons article). The 3rd point ("this one") refers to the "Currently being released" page I assume? Oh, yes, it does! I basically just copied the source and put it here. Apologies! Okay, anyone know why the Duo-Toned and the Two-Headed Lindwurms haven't been added to the Dragon Types page? They were released August 4th, it is now August 20th. I think it's well past the time they should have been added. Sorry about that... my RL is currently extremely hectic. I hope I can get to it in the next few days. By the way registered users can edit the Dragon Types page and everybody is allowed to add them to the list. And feel free to create the dragons article too when you're up to it. I would, but the Currently Being Released kind of states otherwise with the whole "Do Not" list, which is why I didn't touch it. I reworded this section a little bit so it hopefully becomes a teeny tiny bit clearer when you can start to create the dragons article. Itallic = Reworded or newly added text. Create the dragon(s) article (before the dragons of TJ09 and users grow up). These rules apply while the dragon is being released, till the moment when the dragons of users start to become adults. After that the dragons article can be created. Failing to comply with these rules will result in a warning or even a suspension (one week suspension for creating the dragons article before the dragons have grown up). I really hope that after the text was reworded, you feel more assured that you can create the new dragons article whitout the nagging doubts that you may have violated the rules. When I go to the wiki (the "which egg is which" page - I haven't gone to any others recently) - I get a notification, would I like to download something. I don't remember what the extension was. I'm using IE. This isn't happening when I go to other sites and it happened a little while ago on the wiki for me as well. Do you want to open or save ai (43 bites) from us-ads.openx.net? So, no extension, and I assume it has something to do with the ads. edit again: the first few times it happened as soon as I loaded the page, but just now I was reading a page and after a while it happened. It's also happening as I go to other pages besides "which egg is which". I'm sorry that this is happening to you, diaveborn. I have tested this in internet explorer and it didn't happen to me. The ads on Wikia are not supposed to ask you to download something. If you have an account, the best bet is to send a special:contact email to Wikia and explain what is happening.